The demonstrations were sparked by the deaths of two students who were reportedly killed by a speeding bus in Dhaka on July 29. Put simply: Anger over the dangerous conditions on Dhaka's roads. 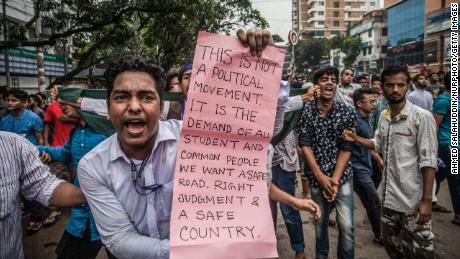 Protests kicked off in the crowded capital after a privately-operated bus ran over a group of students, killing two and injuring several others, eyewitnesses told Bangladesh's state-run news agency, Bangladesh Sangbad Sangstha. While the circumstances surrounding the accident remain unclear, the news agency reported that the bus driver has since been arrested.Road collisions in Bangladesh are not uncommon; more than 3,000 people die in road accidents in the country each year, according to data compiled by the World Health Organization. Despite government warnings to cease demonstrations, student protesters have paralyzed parts of the capital, with teenagers in school uniforms erecting checkpoints and allowing only emergency vehicles to pass. And while they may be at odds with officials, the protesters have won widespread praise for easing Dhaka's congestion and making drivers, even officials, carry driving licenses. "We are witnessing something unprecedented in the history of our transport and infrastructure: Our roads are starting to function in a proper and efficient manner … And the credit for this goes to all the students out there protesting," said a Dhaka Tribune editorial. The days-long demonstrations took a violent turn last week as authorities beat protesters with batons and shut down mobile internet connections as the unrest spread beyond the capital. Police used water cannons and tear gas to disperse student protests outside Dhaka University on Monday as crowds attempted to march through the neighborhood of Shahbagh, Maruf Hossain Sardar, a deputy police commissioner, said at the scene. In another area of Dhaka known as Aftabnagar, youths who were thought to be supporters of the ruling party clashed with students from a privately-run university. The youths were "wielding iron rods and logs and tried to drive away agitating students from the street," according to Belal Ahmed, the head of public relations for North South University. Ahmed added that the clashes spilled out into the road and blocked traffic but the situation had since returned to "normal now and the students left the university." On Saturday, more than 100 people were injured by police, according to local media reports, while a day later, a vehicle carrying US Ambassador Marcia Bernicat was attacked by "armed men." The diplomat was unhurt.The United Nations expressed its concern over the crackdown. 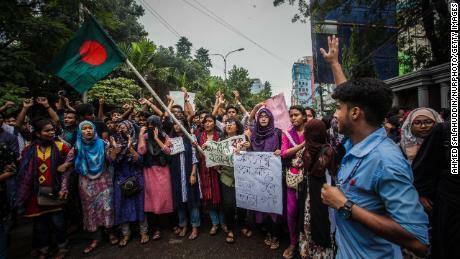 "The concerns expressed by youth about road safety are legitimate and a solution is needed for a mega city like Dhaka," the UN resident coordinator in Bangladesh, Mia Seppo, said in a statement posted on Twitter.Bangladeshi police also arrested a prominent human rights activist and photographer in connection with the protests.Shahidul Alam was detained at his house on Sunday night by about 30 to 35 plainclothes police officers, according to Amina Neyamat, a colleague at Drik Picture Library.Alam's arrest came shortly after he gave an interview to broadcaster Al Jazeera about the protests, saying that they were driven by "larger" factors than road safety alone. He pointed to "the looting of the banks, the gagging of the media, the extrajudicial killings, disappearings, bribery and corruption," according to the broadcaster's website. "Dr. Shahidul Alam has been taken to the detective branch office for interrogation on some issues related to recent unrest," said police spokesman Sohel Rana. He said no further details were available.The Committee to Protect Journalists has since called for Alam's immediate release. "Authorities should also ensure that Alam and all journalists covering unrest in Dhaka are able to work without fear of attack or arrest," CPJ Asia Program Coordinator Steven Butler said. Prime Minister Sheikh Hasina has suggested her political rivals were using the protests to whip up public anger against the government ahead of a general election due in December. The opposition Bangladesh Nationalist Party, led by former prime minister Khaleda Zia, has denied involvement. Political feuding between the two leaders has overshadowed Bangladesh for decades.Hasina — who met with relatives of the two students who were killed earlier this week — urged protesters on Sunday to go home, warning that a "third party" could sabotage the demonstrations. "That's why I request all guardians and parents to keep their children at home. Whatever they have done is enough," she said.Hasina's government has ruled Bangladesh since 2009, but in recent months it has been buffeted by mass protests demanding an end to discriminatory recruitment in the civil service. On Monday, in an attempt to address concerns raised by students, Bangladesh's cabinet approved new road safety regulations, which include punishing some traffic accident fatalities by death. Law Minister Anisul Huq told CNN the new law also includes five years' imprisonment and a monetary fine for reckless driving. "It is very, very tragic. We are going to take stern action against the perpetrators of such offense [negligent driving]. It is in the best interest of the country the protesters go back to the schools where they belong," Huq said. The Road Transport Act 2018 must now go before parliament for final approval, according to cabinet secretary Mohammad Shafiul Alam. CNN's Sugam Pokharel reported from New Delhi while journalist Farid Ahmed reported from Dhaka. CNN's Bard Wilkinson wrote from Hong Kong and Lauren Said-Moorhouse wrote from London.